listen), "Island of France"), also known as the région parisienne ("Parisian Region"; see Etymology), is one of the 18 regions of France, and includes the city of Paris. It covers 12 012 square kilometers (4 638 square miles), and has its own regional council and president. It has a population of 12,005,077 as of January 2014, or 18.2 percent of the population of France. 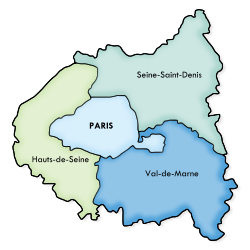 The region is made up of eight administrative departments: Paris, Essonne, Hauts-de-Seine, Seine-Saint-Denis, Seine-et-Marne, Val-de-Marne, Val-d'Oise and Yvelines. Created as the "District of the Paris Region" in 1961, it was renamed after the historic province of Île-de-France in 1976 when its administrative status was aligned with the other French administrative regions created in 1972. Residents are sometimes referred to as "Franciliens", an administrative word created in the 1980s. The GDP of the region in 2012 was 612.3 billion euros (or US$788 billion at market exchange rates). It has the highest per-capita GDP among regions in France, and the third highest of regions in the European Union. In 2014 thirty companies from the Fortune Global 500 had their headquarters in the Paris Region. Although the modern name "Île-de-France" literally means "Island of France", the etymology is in fact unclear. The "island" may refer to the land between the rivers Oise, Marne and Seine, or it may also have been a reference to the Île de la Cité, in which case "Island of France" was originally a pars pro toto or perhaps a metonym. Yet another possibility is that the term is a corruption of a hypothesized Frankish language term "Liddle Franke" meaning "Little France" or "little Frankish land", so the modern reference to an "island" may be coincidental. However, this theory might be anachronistic, since the name "L'Île-de-France" (including the definite article) is not documented prior to 1387. The ancient regime Isle of France (then referred as such in English) is one of the historical provinces of France, and the one at the centre of power during most of French history. The province was centred on Paris, seat of the Crown of France. The area around Paris was the original personal domain of the king of France, as opposed to areas ruled by feudal lords of whom he was the suzerain. This is reflected by divisions such as the Véxin Français and the Véxin Normand, the former being within the King of France's domain, the latter being within the Duke of Normandy's fief. The old provinces were abolished during the French Revolution in the late 18th century and divided between newly devised subdivisions called departments. An area not entirely corresponding to the historical Île-de-France province was created in 1959 as district de la région de Paris ("District of the Paris Region"). The district was reconstituted as the Île-de-France region on 6 May 1976 and increased administrative and political powers devolved in the process of regionalisation in the 1980s and 1990s. Nature of Île-de-France: view of Fontainebleau Forest. Île-de-France has a land area of 12,011 km2 (4,637 sq mi). It is composed of eight departments centered on its innermost department and capital, Paris. Around the department of Paris, urbanization fills a first concentric ring of three departments commonly known as the petite couronne ("small ring"), and extends into a second outer ring of four departments known as the grande couronne ("large ring"). The former department of Seine, abolished in 1968, included the city proper and parts of the petite couronne. The petite couronne consists of the departments of Hauts-de-Seine, Seine-Saint-Denis, and Val-de-Marne, and the grande couronne of those of Seine-et-Marne, Yvelines, Essonne, and Val-d'Oise. The river Seine runs through the region. The Seine has many tributaries, including the rivers Oise and Aube. It is France's second largest river after the Loire. The region is in an area of lowland called the Paris Basin. South of this region lies the Massif Central, an area of highlands that are higher than the surrounding countryside but far lower than the Alps. The Paris region is France's premier center of economic activity, with a 2012 gross domestic product (GDP) of €612 billion (US$760 billion). It's GDP is estimated to reach €650 billion (US$904 billion) by 2015. In 2011, its GDP ranked second among the regions of Europe and its per-capita GDP was the fourth-highest in Europe. While the Paris region's population accounted for 18.8 percent of metropolitan France in 2011, the Paris region's GDP accounted for 30.1 percent of metropolitan France's GDP. It hosts the world headquarters of 30 Fortune Global 500 companies. The regional economy has been gradually shifting towards high-value-added service industries (finance, IT services, etc.) and high-tech manufacturing (electronics, optics, aerospace, etc.). The Paris region's most intense economic activity takes place in the central Hauts-de-Seine department and suburban La Défense business district, in a triangle between the Opéra Garnier, La Défense and the Val de Seine. While the Paris economy is dominated by services, and employment in manufacturing sector has declined sharply, the region remains an important manufacturing centre, particularly for aeronautics, automobiles, and "eco" industries. The per-capita income of the region is the largest of NUTS-1 Regions in the European Union and is third per capita after Luxembourg and Brussels with $71 126. Tourism in Paris is a major component of the regional economy, since the region includes both Paris and Disneyland Paris. The Paris region received 32.3 million visitors in 2013, putting the region just ahead of London as the world's top tourist destination region, measured by hotel occupancy. The largest numbers of foreign tourists to the Paris region came in order from the United Kingdom, the United States, Germany, Italy and China. According to the 2011 census, 59.0 percent of the regional workforce is in commerce, transportation, and market services: 26.8 percent worked in non-market services (public administration, education, human health and social work activities); 8.6 percent worked in manufacturing, mining, and utilities; 5.3 percent worked in construction; and 0.3 percent worked in agriculture. The majority of the region's salaried employees fill 370 000 businesses services jobs, concentrated in the north-western 8th, 16th and 17th arrondissements. Paris' financial service companies are concentrated in the central-western 8th and 9th arrondissement banking and insurance district. Paris' department store district in the 1st, 6th, 8th and 9th arrondissements employs 10 percent of mostly female Paris workers, with 100 000 of these registered in the retail trade. Fourteen percent of Parisians work in hotels and restaurants and other services to individuals. Nineteen percent of Paris employees work for the state in either administration or education. The majority of Paris' health care and social workers work at the hospitals and social housing concentrated in the peripheral 13th, 14th, 18th, 19th and 20th arrondissements. Outside Paris, the western Hauts-de-Seine department La Défense district specializing in finance, insurance and scientific research district is the largest dedicated business district in all of Europe and employs more than 150 000 as of 2012 and estimated to reach 200 000 by 2015 and 300 000 by 2019. and the north-eastern Seine-Saint-Denis audiovisual sector has 200 media firms and 10 major film studios. Paris' manufacturing is centered in its suburbs: the city itself has 75 000 manufacturing workers, with most of these in the textile, clothing, leather goods and shoe trades. Paris region manufacturing specializes in transportation, mainly automobiles, aircraft and trains, but this is in a sharp decline: Paris proper manufacturing jobs dropped by 64 percent between 1990 and 2010, and the Paris region lost 48 percent during the same period. Most of this is due to companies relocating outside the Paris region. The Paris region's 800 aerospace companies employed 100 000. Four hundred automobile industry companies employ another 100 000 workers: many of these are in the Yvelines department around the Renault and PSA-Citroen plants (this department alone employs 33 000), but the industry as a whole suffered a major loss with the 2014 closing of a major Aulnay-sous-Bois Citroen assembly plant. The southern Essonne department specialises in science and technology, and the south-eastern Val-de-Marne, with its wholesale Rungis food market, specialises in food processing and beverages. The Paris region's manufacturing decline is quickly being replaced by eco-industries: these employ about 100 000 workers. In 2011, while only 56 927 construction workers worked in Paris itself, its metropolitan area employed 246 639, in an activity centred largely around the Seine-Saint-Denis (41 378) and Hauts-de-Seine (37 303) departments and the new business-park centres appearing there. The Regional Council is the legislative body of the region. Its seat is in Paris, at 33 rue Barbet-de-Jouy in the 7th arrondissement. On December 15, 2015, a list of candidates of the Union of the Right, a coalition of centrist and right-wing parties, led by Valérie Pécresse, narrowly won the regional election, defeating the Union of the Left, a coalition of Socialists and ecologists. The socialists had governed the region for the preceding seventeen years. In 2016, the new regional council will have 121 members from the Union of the Right, 66 from the Union of the Left and 22 from the extreme right National Front. 1961–1969: Paul Delouvrier (civil servant) – Very influential term. Responsible for the creation of the RER express subway network in the Île-de-France and beyond. Paris's demographic development, represented by the Paris Metropolitan Area, fills most of the Île-de-France: its central built-up area, or pôle urbain ("urban cluster") extends beyond the Île-de-France's inner three petite couronne departments, and this is surrounded by a commuter belt "rim" that extends beyond the Region's four outer grande couronne departments in places. “Petite Couronne” redirects here. For the municipality in Upper Normandy, see Petit-Couronne. The Petite Couronne (Little Crown, i.e. Inner Ring) is the hub of the urban agglomeration of Paris. It is formed by the 3 departments of Île-de-France bordering with the French capital and forming a geographical crown around it. The departments, until 1968 part of the disbanded Seine department, are Hauts-de-Seine, Seine-Saint-Denis and Val-de-Marne. The most populated towns of the Petite Couronne are Boulogne-Billancourt, Montreuil, Saint-Denis, Nanterre and Créteil. The Grande Couronne (Greater Crown, i.e. 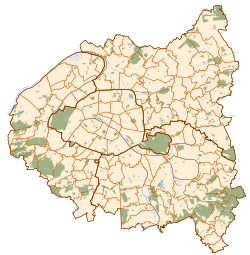 Outer Ring) includes the towns of the metropolitan area part of the other 4 departments of Île-de-France not bordering with Paris. They are Seine-et-Marne (77), Yvelines (78), Essonne (91) and Val-d'Oise (95). The latter three departments formed the Seine-et-Oise department until this was disbanded in 1968. The city of Versailles is part of this area. Census returns until 2011; official January estimates from INSEE from 2012 on. Template:Collapsible Table Ile-de-France Region top countries & territories of birth Paris and the Île-de-France region hosts one of the largest concentrations of immigrants in Europe. As of 2006, about 35% of people (4 million) living in the region were either immigrant (17%) or born to at least one immigrant parent (18%). At the 2010 census, 23.0% of the total population in the Île-de-France region had been born outside Metropolitan France, up from 19.7% at the 1999 census. ^ a b INSEE. "Estimation de population au 1er janvier, par région, sexe et grande classe d'âge – Année 2014" (in fr). http://www.insee.fr/fr/regions/idf/reg-dep.asp?theme=2. Retrieved 2015-03-29. ^ Eurostat. "2014 GDP per capita in 276 EU regions". http://ec.europa.eu/eurostat/documents/2995521/7192292/1-26022016-AP-EN.pdf/602b34e8-abba-439e-b555-4c3cb1dbbe6e. Retrieved 2016-10-07. ^ Paris Chamber of Commerce and Industry, Contribution des CCI de Paris - Île-de-France à la révision du SDRIF, page 110. "TEM Paris – La Défense – QCA" (in fr) (PDF). Archived from the original on 2007-03-02. https://web.archive.org/web/20070302110736/http://www.etudes.ccip.fr/archrap/pdf06/SDRIF-06-axe_3.pdf. Retrieved 2007-09-01. ^ a b "Produits Intérieurs Bruts Régionaux (PIBR) en valeur en millions d'euros" (in fr) (XLS). INSEE. http://www.insee.fr/fr/ppp/bases-de-donnees/donnees-detaillees/pib-va-reg-base-2005/produit-interieur-brut-reg-2008-2011.xls. Retrieved 5 May 2013. ^ "The Most Dynamic Cities of 2025". Foreign Policy. https://foreignpolicy.com/articles/2012/08/13/the_most_dynamic_cities_of_2025. Retrieved 2 November 2014. ^ "Estimation de population au 1er janvier, par région, sexe et grande classe d'âge" (in French). Institut National de la Statistique et des Études Économiques. http://www.insee.fr/fr/ppp/bases-de-donnees/donnees-detaillees/estim-pop/estim-pop-reg-sexe-gca-1975-2012.xls. Retrieved 5 May 2013. ^ Fortune. "Global Fortune 500". http://fortune.com/global500/. Retrieved 17 November 2014. ^ a b c d e f g h i j k l "L'Industrie en Île-de-France, Principaux Indicateurs Régionaux". INSEE. http://www.ile-de-france.gouv.fr/content/download/5429/38877/file/L’industrie%20en%20Ile-de-France%20–%20Principaux%20indicateurs%20régionaux.pdf. Retrieved 24 November 2014. ^ "Paris named as the world's top tourist destination". Daily Mail. //http://www.dailymail.co.uk/travel/article-2578198/Paris-named-tourist-destination-world.html. Retrieved 28 November 2014. ^ a b "EMP2 - Emplois au lieu de travail par sexe, statut et secteur d'activité économique - Aire urbaine 2010 de Paris (001)" (in fr). INSEE. http://insee.fr/fr/themes/tableau_local.asp?ref_id=EMP2&millesime=2011&niveau=1&typgeo=AU2010&codgeo=001. Retrieved 17 November 2014. ^ a b c d e "Île-de-France - A la Page Nº288 - INSEE 2007" (Press release). November 2007. http://www.insee.fr/fr/insee_regions/idf/themes/alapage/alap288/alapage288.pdf. Retrieved 24 November 2014. ^ "Emplois au lieu de travail - Département de Paris (75)". INSEE. http://insee.fr/fr/themes/tableau_local.asp?ref_id=EMP2&millesime=2011&typgeo=DEP&typesearch=territoire&codgeo=Paris+%2875%29&territoire=OK. ^ "EMP2 - Emplois au lieu de travail par sexe, statut et secteur d'activité économique - Département de la Seine-Saint-Denis (93)" (in fr). INSEE. http://insee.fr/fr/themes/tableau_local.asp?ref_id=EMP2&millesime=2011&typgeo=DEP&typesearch=territoire&codgeo=DEP+-+Seine-Saint-Denis+%2893%29&territoire=OK. Retrieved 17 November 2014. ^ "EMP2 - Emplois au lieu de travail par sexe, statut et secteur d'activité économique - Département des Hauts-de-Seine (92)" (in fr). INSEE. http://insee.fr/fr/themes/tableau_local.asp?ref_id=EMP2&millesime=2011&typgeo=DEP&typesearch=territoire&codgeo=Hauts-de-Seine+%2892%29&territoire=OK. Retrieved 17 November 2014. ^ Île-de-France Region official site. "Results of 2015 Regional Elections". http://www.iledefrance.fr/fil-actus-region/regionales-2015-chiffres-cles-du-scrutin. Retrieved 16 December 2015. ^ a b c INSEE. "Estimation de population au 1er janvier, par département, sexe et grande classe d'âge – Année 2011" (in fr). http://www.insee.fr/fr/ppp/bases-de-donnees/donnees-detaillees/estim-pop/estim-pop-dep-sexe-gca-1975-2013.xls. Retrieved 2014-02-20. ^ "Fichier Données harmonisées des recensements de la population de 1968 à 2010" (in fr). INSEE. http://insee.fr/fr/themes/detail.asp?reg_id=99&ref_id=fd-rp19682010&page=fichiers_detail/rp19682010/telechargement.htm. Retrieved 25 November 2013. ^ "Yerevan - Partner Cities". Yerevan Municipality Official Website. Technology Management Center of Yerevan. http://www.yerevan.am/3-233-233.html. Retrieved 2013-11-04. Wikivoyage has a travel guide for Île-de-France. This page uses content from the English language Wikipedia. The original content was at Île-de-France. The list of authors can be seen in the page history. As with this Familypedia wiki, the content of Wikipedia is available under the Creative Commons License.